Mr. Elmer Lee Busby, age 73, passed away on Monday, February 26, 2018 at his home in Morton, MS. Visitation will be held on Tuesday, February 27, 2018 from 5 PM until 7 PM and again on Wednesday February 28, 2018 from 12:30 PM until 2:20 PM. Funeral Services will be held on Wednesday February 28, 2018 at 2:30 PM with Rev. Don Cannon officiating. Burial followed in the Morton Memorial Gardens. Wolf Funeral Services in Morton, MS is in charge of the arrangements. Mr. Busby had lived in Morton, MS for fifty years where he moved from Alabama. He was a member of the East Morton Baptist Church and attended Church of the King in Morton, MS. 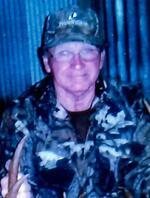 He was an avid outdoorsman who loved to hunt and fish. He was the owner of B & B Gutter for many years. He was preceded in death by his parents, Ellis Busby and Lucille Roland. He is survived by his wife, Debbie Busby of Morton, MS; five sons, Jeff Busby (Angela) of Raymond, MS, Joey Busby (Teresa) of Lena, MS, David Busby (Lovie) of Morton, Shannon Busby (Heather) of Madison, MS and Eric Busby of Starkville, MS; three brothers, Willie Busby, Kenny Busby (Patsy) and Allen Busby (Dianne) all of Morton, MS; eight grandchildren, Kaitlyn Busby, Lauren Busby, Garrett Busby, Abbey Busby, Camryn Busby, Kirsten Busby, Dalton Busby and Cade Busby; and a host of nieces, nephews and other relatives. Pallbearers will be Jeff Busby, Joey Busby, David Busby, Shannon Busby and Eric Busby. You may leave an on-line condolence or light a memory candle by visiting our website at www.wolffuneralservices.com. To send flowers to the family of Elmer Lee Busby, please visit our Heartfelt Sympathies Store.